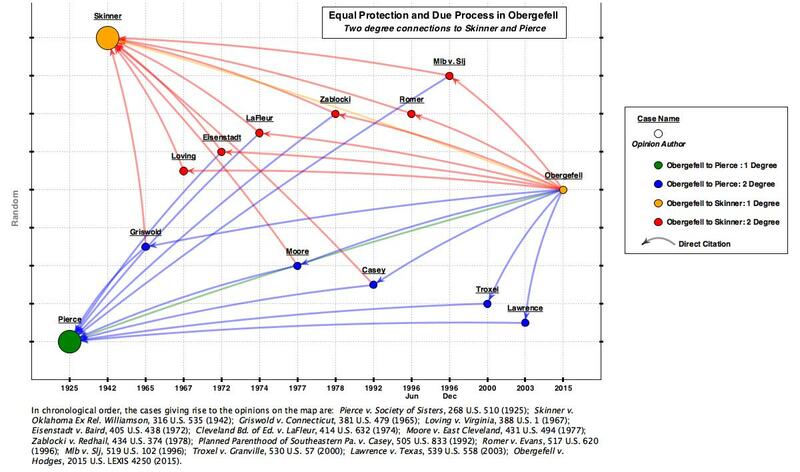 Obergefell: Equal Protection and Due Process Convergence? The map above shows a network of cases cited by Kennedy in Obergefell that connect via direct citation back to either Pierce v. Society of Sisters or Skinner v. Oklahoma. Note that cases represented in blue cite back to Pierce and are generally regarded as due process cases (Pierce is a foundational substantive due process case). Similarly, cases represented in red cite back to Skinner and are generally regarded as equal protection cases (Skinner is a foundational equal protection case). Importantly, the Court struck down the discriminatory scheme at issue in all of the cases displayed in this network. And in most of these cases, the Court acted under both equal protection and due process — as shown by red and blue cite lines. Now the network above does not represent all the precedent Kennedy cited in support of his idea of EP/DP convergence. Rather, the map uses citations back to Pierce and/or Skinner as a blunt proxy of this idea. Readers interested in the details of the cases can follow the links on the map above to the underlying opinions in Casetext. Alternatively, readers can open an identical map at this link, which in turn contains links to the Supreme Court Database instead of the opinions. Together the maps provide a useful starting point for investigations into the convergence idea.